Albert Einstein is a German-born, Nobel Prize award-winning theoretical physicist that is best known for his mass-energy equivalence formula E = mc2, and his development of the theory of relativity, which is with the theory of quantum physics, the two pillars of modern physics. Read on to find out more about the early life, relationship history, and religious beliefs of the revered scholar. Albert Einstein was born to non-observant Ashkenazi Jewish parents; Pauline Koch and Hermann Einstein, on the 14th of March 1879, in Ulm, in the Kingdom of Württemberg, what is today modern the day Germany. His father was a salesman and engineer who later co-founded an electrical equipment manufacturing company. Einstein received his early education at a Catholic elementary school in Munich before transferring to the Luitpold Gymnasium (renamed the Albert Einstein Gymnasium), also in Munich. As a child, Einstein showed an exceptional understanding of math and physics, which put him years ahead of his peers. Because of this, at the young of 16, he took the entrance examinations for the Swiss Federal Polytechnic in Zürich without having completed secondary school. Despite recording exceptional grades in math and physics, he failed the general part of the examination, which meant that he had to go back and finish secondary school. A year later, he successfully gained admission to Zürich Polytechnic, graduating in 1900, before taking up different teaching jobs across Europe in the University of Bern, Charles-Ferdinand University in Prague, the Prussian Academy of Sciences in Berlin, among many others. By 1933, Albert Einstein successfully emigrated to the United States during the rise to power of the Nazis under Adolf Hitler. He took a teaching position at the Institute for Advanced Study before becoming an American citizen in 1940. He continued to work until he died on the 17th of April, 1955, in Princeton Hospital, after having refused surgery to correct complications he developed from internal bleeding. Albert Einstein notably described the belief of the existence of an anthropomorphic God, such as the God of Abrahamic religions, who concerns himself with the fates and doings/day to day activities of human beings, as “naive”. He further did not hold regard for the concept of Heaven and Hell where a creator would give everlasting reward and punishments to his creations. Albert Einstein was married twice; first to Serbian mathematician, Mileva Maric from 1903 to 1919, and then to his first cousin, Elsa Einstein from 1919 to the time of her death in 1936. The legendary theoretical physicist met Maric during his time at Zürich Polytechnic, where she was the only woman among six students who were accepted in the mathematics and physics section of the teaching diploma course in 1896. 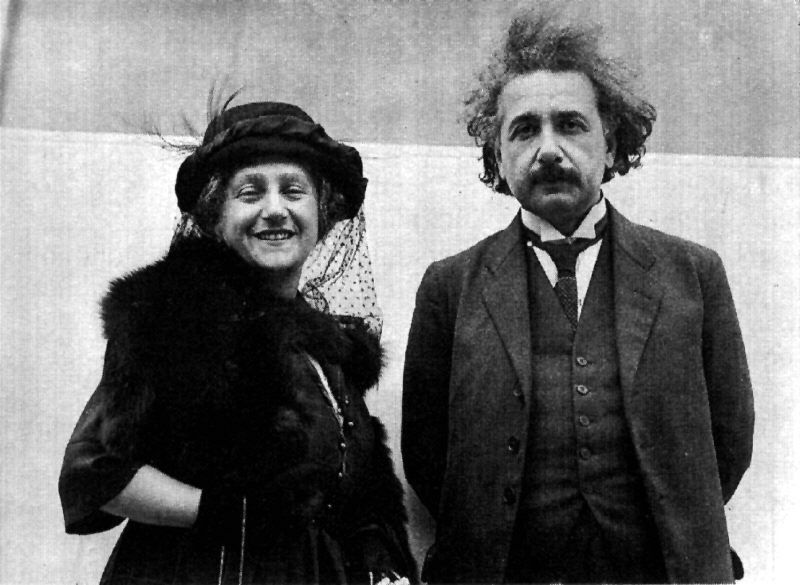 As the story goes, Maric and Albert Einstein were best of friends before later starting a romantic relationship that led to the disruption of her academic career as she became pregnant with his child in 1901. In January 1902, in Novi Sad, Serbia, where her parents resided, Maric gave birth to a daughter whose name is thought to be Lieserl or Hansel. It is not clear what happened to the little girl as a few reports suggest that she died about a year later after suffering from scarlet fever, while others say she was put up for adoption. Following the traumatic ordeal, Einstein and Maric exchanged vows in Bern, Switzerland, in 1903, where he had chosen to settle as he found work at the Federal Office for Intellectual Property. The couple welcomed their second child, son Hans Albert, a year later in 1904. In 1910, a second son named Eduard was born in Zurich where the family had moved due to Einstein’s new job at the University of Zurich. In 1912, Einstein began a romantic relationship with his cousin, Elsa, which prompted him and his wife to separate in 1914 when she found out. The pair lived apart for five years before divorcing in 1919, giving room for him to marry Elsa. The pair were married until 1936 when she died from heart and kidney disease. Albert Einstein was said to have had a height of 5 feet 7.5 inches or 172 cm, which was listed in his Declaration of Intention form to become a United States citizen. In his lifetime, Einstein published more than 450 scientific and non-scientific papers. His work earned him numerous awards and honors, most famously the 1921 Nobel Prize in Physics.